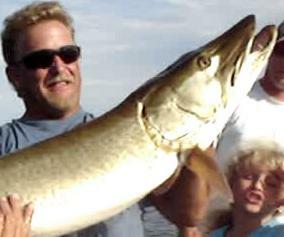 I started musky fishing in 94, I have been a licensed guide in Indiana Since 2000. 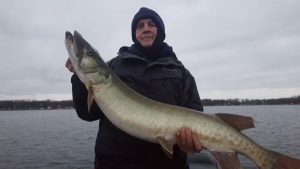 The Founder of Webster Lake Guide Service and Tippy River Tackle (home of the Darter) a full service tackle company,& I am a Member of Muskies Inc as well as I am on Board of Directors WLMC Chapter #49 Since founded in 2000. I do seminars for sport clubs and fishing expos. I also enjoy fishing as many tournaments that time allows. I have done 2 TV shows with Raghorn News and hope to produce my own How to fishing DVD soon. I am on the pro staff at Lund, Mercury, Pure Fishing, Salmo International, Beckmann/Lindy tackle, Shack Attack Lures . I have Placed in the top 15 Muskies Inc Release contest for the past 5 years, Top 15 in the Hoosier Classic for past 5 years, and in the top 5 for the last 6 WLMC cash Tourneys! In 07 won the Big Fish award in the Classic.